It was wonderful to read such a deep statement of a modern Christian faith, and such a profound description of what it means to be a principled conservative. But as a centrist liberal, I found I was writing a second book in my head as I read yours. 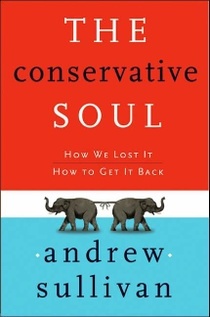 The title of this parallel-universe book was, of course, "The Liberal Soul- How We Lost It, How to Get It Back". I started thinking seriously about a liberalism of doubt - what it would be like, and how we can make progress toward it. If I had to sum up the lesson of your book in one phrase it would be "humility, as Jesus taught it". Have we liberals been humble in the spirit of Jesus? In many ways, no, and we would be better liberals if we were. All too often, liberals have been like a Victorian Lady Bountiful - throwing money at the problems of the poor, but without truly respecting either the poor people we were attempting to benefit or the taxpayer who provided the money. As a small example, I was against welfare reform in the 1990s, because I was afraid that poor children would go hungry. But there was a tinge of elitism there. I would never have settled for life on the dole, since I was a smart person who needed a career - but it didn't bother me nearly as much as it should that I expected inner-city single mothers to accept life on the dole. A truly humble person would have seen that was an atrocity. If we had truly respected the taxpayers we expected to contribute to social programs, we would have instituted ferocious measures of effectiveness - and cut off any program that wasn't achieving its objectives. Conservatives would still have objected to social programs, but I suspect conservatives of doubt would have objected much less if liberals of doubt were totally committed to effective programs with zero waste. Liberals of doubt might also wonder if the abortion of an eight month fetus is really a minor event. There's a lot to be learned on both sides. Indeed, there is. In the book, some conservative critics who refuse to read it might be surprised by some of my positions. I favor banning abortion in the second and third trimesters (and reversing Roe), and favor the old Christian approach to balancing various goods in deciding when to allow a terminally ill person to die. I truly believe that all procured abortion is a profound moral wrong - I just respect those who sincerely disagree about the moral status of an early embryo and fetus, and see the law as a way for us to be able to live together with varying views, rather than as instrument to impose one view on everybody alike. I think late-term abortion is one of the most grotesque practices in America today, and would have no qualms in voting to criminalize it. All this is in the book. But it is so offensive to the Christianist right that they have vowed not to read or buy it. That tells you something, I think, about how extreme they have become. I am glad that so many liberals appear to have more open minds.